This One Dish Moroccan Chicken recipe is so easy to make; just prepare your casserole pan, add all the ingredients, pop it into the oven and dinner is ready in 55 minutes. This guest-worthy dish tastes like you spent the day in the kitchen, but you didn’t! Quick and easy to make, let your oven do all the work. Preheat the oven to 400°F/200°C. Line a non-metallic 11×7-inch/2 L baking dish with wet parchment paper. Place the chicken thighs in the prepared dish and sprinkle evenly with the garlic, olives, oregano, capers, basil, paprika, and black pepper. Spread the tomatoes evenly over the chicken. Pour over the wine (if using). Scatter the prunes evenly over the chicken, pushing them down into the liquid with a spoon so they’ll plump up during cooking. Bake, uncovered for 50-55 minutes or until the chicken is no longer pink inside and a meat thermometer inserted into each piece of chicken registers 165°F/74°C. Remove from the oven and let sit for 5 minutes. Divide equally between four shallow soup bowls. Ladle cooking liquid over. I like to serve this either cooked barley or quinoa and a green vegetable like peas, baby kale or broccoli. Made this last night for supper, amazing! Only substitution I made was replacing the olives with black olives that had been seasoned with rosemary in olive oil. Tasted great. 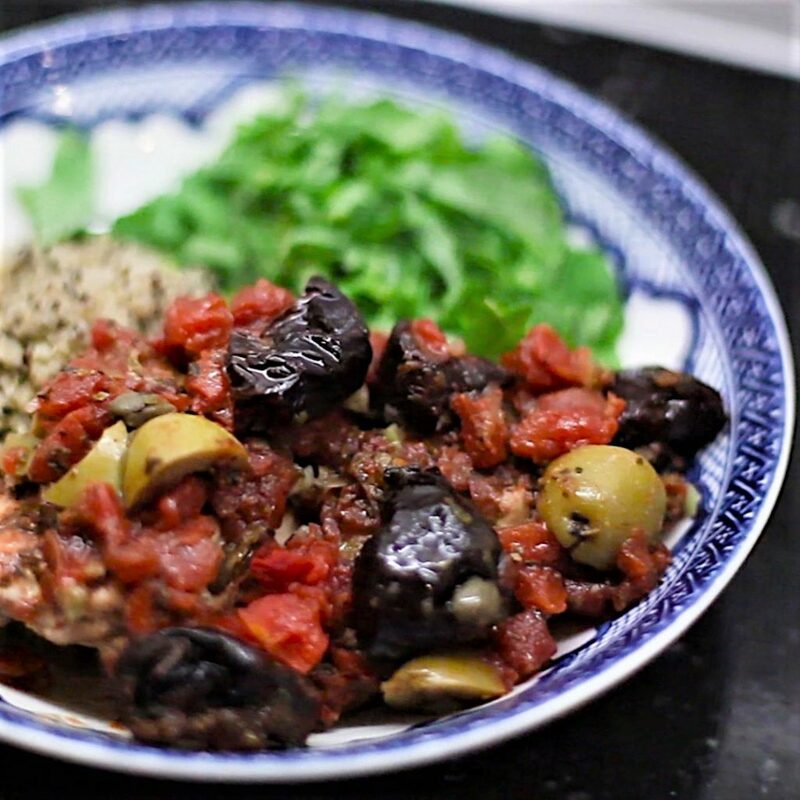 We also loved the prunes in the recipe, they added a wonderful flavour and loved the sweetness as they were eaten with the chicken. Need to use more prunes! Thanks for the great recipe! I’m so glad you loved the recipe, its a family favourite at my house.